The Federal Railroad Administration (FRA) and NJ TRANSIT are jointly preparing an Environmental Impact Statement (EIS) to evaluate the Hudson Tunnel Project. 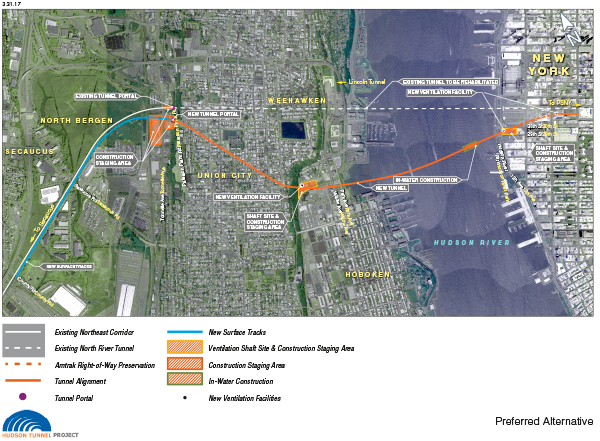 The Project is intended to preserve the current functionality of the Northeast Corridor’s (NEC) Hudson River rail crossing between New Jersey and New York and strengthen the resiliency of the NEC. The EIS is being prepared pursuant to the National Environmental Policy Act of 1969 (NEPA). As appropriate, FRA and NJ TRANSIT are coordinating with Amtrak and the Port Authority of New York and New Jersey (PANYNJ) on the preparation of the EIS. The FRA and NJ TRANSIT invite you to learn about the Preferred Alternative and the environmental review process. Per Federal Register notification, the official comment period for the Draft EIS ended August 21, 2017. The Draft Environmental Impact Statement is available at the link below.